This super easy and quick Harissa Lemon Chickpea Bowl is delicious on a warm summer evening. It’s both spicy and refreshing and makes a great light evening meal or lunch dish. All the fresh ingredients, the cucumber, zucchini, lemon, cilantro, mint and parsley, add a clean, crisp taste. The Harissa dressing adds a sweet, smoky spiciness. If you don’t want to spend lots of time in the kitchen or have a big group of friends coming over, this is the perfect dish to make. 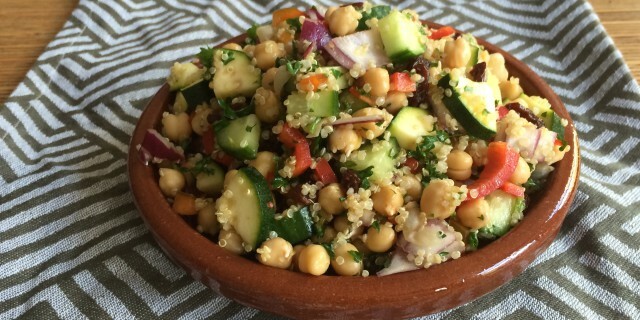 You cut your veggies while cooking your quinoa (which is ready in 10 minutes). Then you add everything to all large salad bowl, add the drained quinoa at the very last moment, and you can serve it right away. It will still taste amazing the next day, so if you make extra you can take it to work for lunch the following day.